This post is wearing sunglasses and a black trenchcoat, narrating itself to you in a low, gravelly voice. 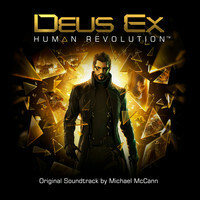 That’s right, it’s the Deus Ex: Human Revolution soundtrack. The main theme, Icarus, was released ahead of the game itself and immediately piqued my interest. After the dystopian cyberpunk conspiracy-fest of the first game, both the art style and music of Human Revolution evoked something different, something intriguing and new. Something thoughtful that might stand out from the pack of bald space marines and bro-shooters. And you know what? It delivered. Human Revolution was exquisite, easily forgiven the obvious plot twists and appalling boss fights. Any missteps were utterly eclipsed by the brilliant characters who utterly refused to become stereotypes, the engaging story, the fact that everybody had genuine and understandable motivations, the way it brought back the original game’s non-linear gameplay, emergent situations and multiple solutions. Eidos Montreal inject a staggering amount of attention to detail throughout and at every turn it’s clear that the designers and the dev team loved their game and the world they set it in. Homages to the original Deus Ex, playful nods to other games of the era, even cheerful digs at the depressing waste of bytes that was Invisible War. Little notes and asides that add so much to the depth and credibility of the world are just left there for the finding rather than being pushed in your face in case you might miss them – a refreshing change in a world where designers are so afraid you might miss out on some of their content that they practically throw it at you rather than let you find it on a second or third playthrough. The music, like the game, is great. Perfectly paced, moody and atmospheric. Michael McCann on perfect form. The whole album is always on-theme, and you can jump into it at any point and immediately know you’re listening to Deus Ex. Like all the best video game music it brings back memories and makes me want to get right back in there.